If you need high-security garage exterior lighting, then your best value is probably to consider the use of a garage metal halide lighting fixture at every point where high-security lighting is required. There are a variety of garage lighting fixture types that can be used that surface mount on both soffits (overhangs), and wall surfaces. These garage lighting fixture types spread plenty of even light over large areas and are ideal for areas requiring high-security lighting. The unit shown at the left is manufactured by ValuTek™ and is designed for surface mounting on a horizontal surface such as a roof overhang or soffit. It measures 12" long x 12" wide x 8.8" deep and produces 14,000 lumens. The frame is heavy-duty cast aluminum with baked-on powder coating finish. The lens cover is polycarbonate and provides excellent light diffusion. The fixture has a UL rated ballast with quad voltage of 120V, 208V, 240V and 277V. The fixture comes with a 175 watt lamp, is energy efficient, and provides 5 times the light of a 200 watt bulb. The finish is dark brown. This garage lighting fixture generally retails for below $140.00 and the 175 watt lamps below $15.00. 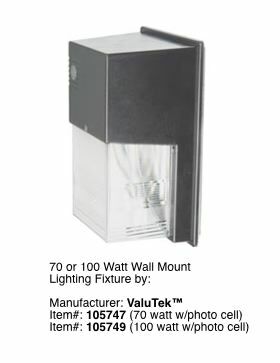 If your exterior garage lighting plan calls for wall mounted garage exterior lighting fixtures then consider the unit shown at the right manufactured by ValuTek™. This unit comes with a precision die-cast aluminum housing and a impact-resistant one piece lens. It features a hinged, removable refractor door that allows for quick and easy access to the lamp and ballast. The unit measures 18.5" wide x 13" high x 9" deep. The ballast is set-up for quad voltage of 120V, 208V, 240V and 277V. It comes with a 175 watt lamp. The finish is dark brown. This garage lighting fixture generally retails for below $130.00 and the 175 watt lamps below $15.00. 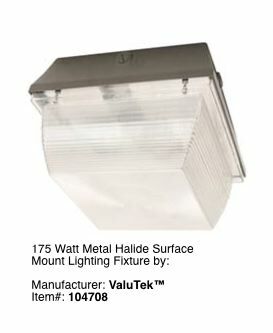 If you need brighter than normal garage exterior lighting next to a man-door leading into your garage, then consider the unit shown at the left manufactured by ValuTek™. 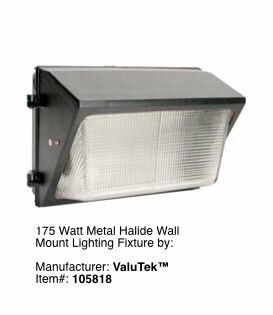 This wall mounted garage lighting fixture comes as incandescent (shown) or metal halide HID. The incandescent version is available as a 70 watt or 100 watt unit. This fixture is suitable for wet locations, has a black die-cast aluminum housing and a polycarbonate lens. Garage Tips: Metal Halide type lighting fixtures put out a lot of heat and should never be mounted at any height that a animal or human can come in contact with them. Check out our Portable Garage Lighting page for some unique ideas on spot-lighting those hard to reach areas.